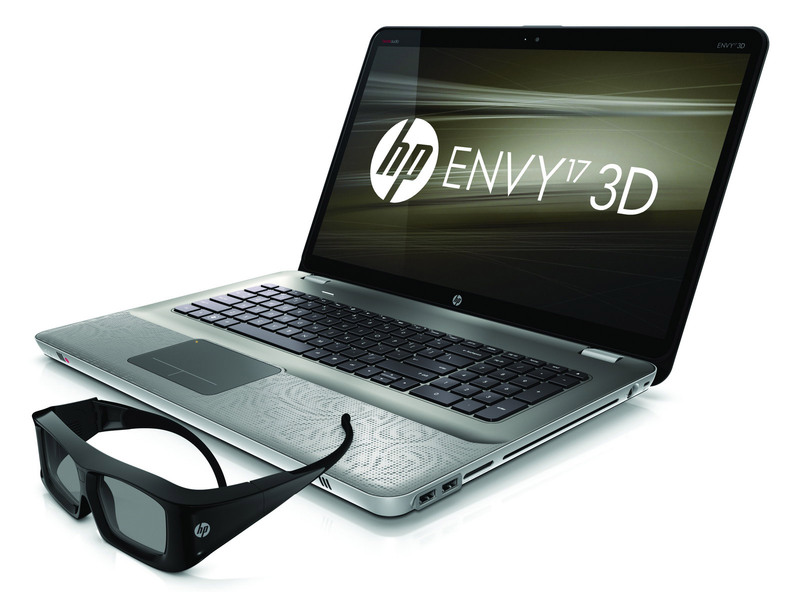 Now let us see how the laptop performs when used for playing games in 2D mode (plain 3D) and in stereoscopic 3D mode. In the table above I have summarized the results from testing the laptop in 8 different recent and popular games that do perform well when played in stereoscopic 3D mode. The first column shows the average framerate achieved in the games when the stereo 3D mode is not active and the second one shows the average framerate when playing the same games in stereo 3D mode. 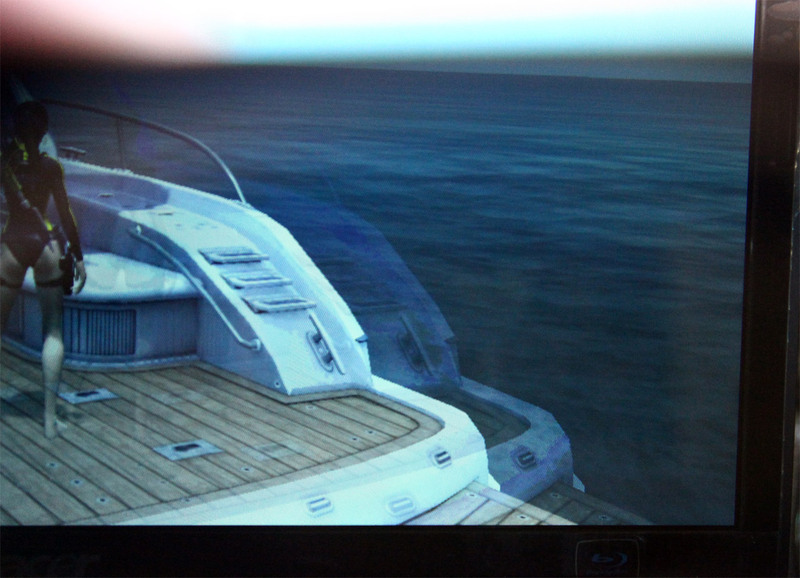 In both cases the games were running in 1366×768 resolution, with the same level of detail (set to medium, not high! ), no AA/AF filtering applied and with some additional special effects disabled as well as extras such as PhysX (where supported) disabled. I’ve used three basic colors to make things even more clear when looking at the table, with red meaning uncomfortable to be played, yellow for so-so and green for an framerate that ensures comfortable play. As you can see in 2D mode (plain 2D) all of the games are playable with medium level of details with just a few more demanding where you might need to lower some of the things a bit more than medium, so you can enjoy gaming without the 3D to a decent level on that particular laptop. The situation with the performance in stereoscopic 3D mode is not that good with most games unplayable or on the edge with fewer not so demanding titles still playable. And going to the low detail level in games just in order to be able to play in stereo 3D mode is not something that you should be doing as you will most likely be disappointed by the graphics even though it is in stereo 3D. This is precisely why I say this laptop is not for gamers, but it is still Ok for multimedia 3D use such as movies, photos etc. and if you want to play games then you should do it in 2D mode. And not for some of the traditional tests I’m doing here in order to see what level of corsstalk/ghosting you can expect from the 3D-capable displays. Starting with the tradition black and white extremes crosstalk test, the results for the black are quite Ok, but for the white the things are not that good. Notice my reflection on the black test photo due to the glossy screen that the laptop users. But pretty much every 3D-capable laptop comes with a glossy display, so you don’t have a choice for that like with the 3D-capable LCD monitors where most are still with matted screens. 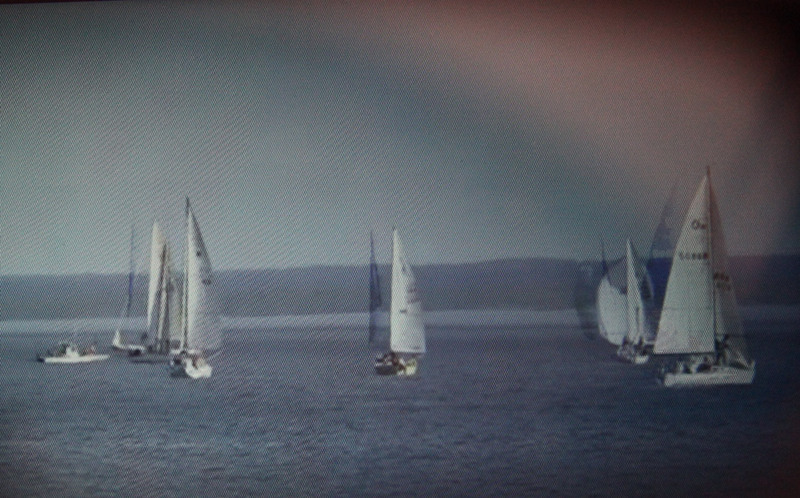 The level of ghosting on the sailboats test video is also not that little as I’ve seen on the latest desktop 3D LCD monitors, this situation kind of reminds me of the earlier models from last year. But still a decent result for a laptop that is already a few months old model. Moving to Tomb Raider Underworld and looking at the top crosstalk the situation is also no a moderate level, something that you can easily enough tolerate if you are using stereoscopic 3D for a while. The situation at the lower end of the screen is a bit worse than I expected, notice how even the figure of Lara is having slight ghosting. 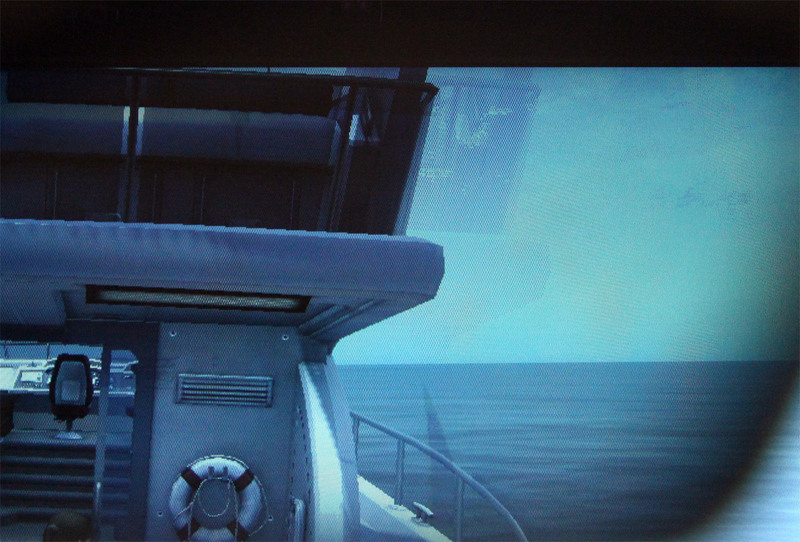 Not that much of color ghosting, but still significant ghosting can be seen at the bottom of the screen when the depth level is pushed to a high level int he game. Of course staying at lower depth levels means that the problem is less apparent, as usual the tests here are kind of pushing things in order to judge the situation in a worst case scenario type of situation. So if in the “bad conditions” the things look good, than they should be even better in a more normal way of use. The display is quite bright by default for a laptop, with a measured maximum brightness level of 241 cd/m2, but the screen can use some calibration to get better color reproduction as the default one is quite a bit off. The level of the black color is a bit higher at about 0.6 cd/m2 and thus the contrast level of 400:1 is not that high either, but you should not forget that we are talking about a laptop here. And for a laptop with a LED backlight the situation is not that bad, but probably Acer wanted to push the brightness level a bit higher and as a result the black got higher brightness as well and the contrast level also suffered from that. The higher level of ghosting can also be related to that. 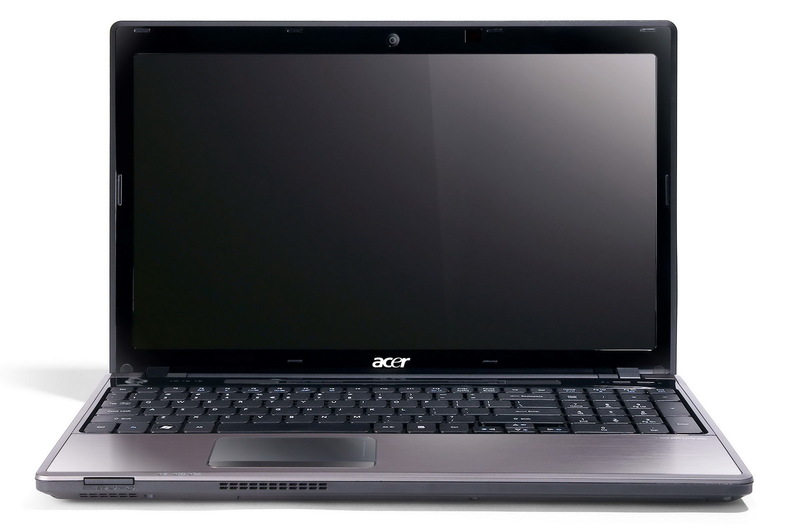 So in conclusion, the Acer Aspire 5745DG 3D Vision laptop is a more affordable 3D-capable laptop good for 3D multimedia use, not powerful enough for gaming in stereo 3D, but pretty Ok for not so demanding gaming in 2D mode. The level of crosstalk/ghosting is not that much so that it is intolerable, although it is not as good as you might expect it to be as well. But for the average price of the laptop, not pushing for too high specifications, what you are getting is not such a bad deal if you need to be able to use 3D on the go. And if you are looking for a gaming laptop that can provide you with stereoscopic 3D capabilities and allow you to play games in stereo 3D mode without worrying about the performance, than you probably should consider a powerful 3D-capable desktop solution instead or have a significantly higher budget planned than about $1000 USD.